In theory, adding a blog to your business website is no big deal. With easy-to-use platforms like WordPress at your disposal, the technical side is a cinch. And you’re bound to be blogging about a topic that you’re an expert in. So what could be simpler? Unfortunately, there’s a little more to it. Organization is essential, as it posting regularly, and both can prove problematic for the professional with no blogging or writing experience. And then there is everything that goes into creating the content that readers find informative, entertaining, and appealing in general. Blogging is much more difficult in theory than in practice. And yet, it is one of the best ways to increase your online presence, reach new customers, and deliver added value for loyal patrons. 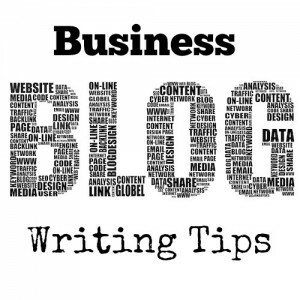 You may just need a few business blog writing tips to help you reach your goals. Topic creation is one of the most common difficulties for business bloggers. In the beginning you probably have tons of ideas, but the slog of daily blogging can quickly cause your well of bright ideas to run dry. The key to maintaining your output is to look for plenty of input. This means staying abreast of industry developments, as well as trending topics that you can tie into. You should also keep a catalog of evergreen ideas on the backburner for days when you’re simply stumped. Plus, there are tons of websites offering business blog writing tips centered on topic creation for your particular niche. Keeping readers engaged requires a steady stream of fresh content, so timely and useful topics are a must. It’s not enough to have a great topic – you need to have a great title to go with it. You’re fighting two major battles: the short attention span that dominates your web surfing audience and a cacophony of competitors clamoring to be heard. Your blog post titles not only need to concisely summarize the character of your content, but they must also grab reader attention. There’s no easy formula to follow here, but anyone familiar with the top business blog writing tips would probably suggest perusing the web in search of titles that grab your attention, as well as ones that make you want to move on. When you take the time to analyze which titles spark your interest versus that ones that leave you wanting, you can start to figure out how to craft your own incredible titles. Visual interest is a key component of blogging that many newbies neglect. But it doesn’t take a tome on business blog writing tips to tell you that the internet is largely a visual medium. Savvy surfers are not in search of a novel, so big blocks of text are bound to be a bit intimidating. As a rule, blogs should be limited to somewhat lighter fare, and a good bet for breaking up textual content is to add graphics, infographics, videos, and white space. There is some contention concerning the proper length of the average blog post and there has been a major shift towards long-form content. Some writers limit themselves to about 300-400 words per post while others work in the 500-1,000 word range, and some go well over 1,000 words. The trick is to strike a balance between the information you want to deliver and the amount your audience is willing to read. Over time you can use metrics to see what works best, but if a post is simply getting too long, think about breaking it up into a series. For consummate professionals, picking up the standard tone and style of blogging can be difficult. After all, you’ve probably grown used to writing in a technical or otherwise professional manner. But consumers aren’t interested in corporate speak or technical jargon. You need to reach them on a personal level, and this requires you to create a voice; a persona; a unique point of view. Readers want to connect with a person, not a corporate entity. And business blog writing tips dictate a conversational tone and a style that is witty, warm, or otherwise human. Since your blog is associated with your business, there is a reasonable expectation that you will try to work in a sales pitch. But you need to keep it to a minimum. Your website is a platform for making sales while your blog should be more about connecting with consumers on a personal level, getting them emotionally invested in your brand, and more importantly, in you. Sales pitches undermine this trust. That said, you should definitely use your blog as a means of introducing new products or services, offering video tutorials, providing side-by-side comparisons to other products, and of course, running contests and giveaways. And calls to action are fine, as well. You just want to avoid the hard sell as much as possible. Readers seeking information and entertainment are not likely to stick around if your blog is nothing more than an infomercial. Your business blog is more than just a platform for sharing information about your company. It’s also an opportunity to open a conversation with consumers, potentially getting them invested in your brand and urging them to share your content with others as a trusted source of information. And business blog writing tips suggest that this requires you to up the ante when it comes to providing added value. You need to think about what your readers want and find ways to deliver. This could mean covering trending topics related to your industry, or you may need to figure out how to add entertainment value to your content. You might end up asking employees to write regular columns in order to establish a variety of voices that different segments of your readership can connect with. Or maybe you need to pose questions or host contests to get the audience involved. You can try a variety of strategies to see what works for your business blog. Adding social media buttons might not necessarily fall under business blog writing tips, per se, but it is an important part of ensuring that your content is easy to share. And if you want to increase readership, sharing is essential. Readers don’t want to work too hard to get their daily dose of your blog, and you can make it easy for them by following standard business blog writing tips like adding an RSS feed, social media profiles for them to follow, and the option to sign up for membership. You can encourage readers to become members by offering notifications and one-click linking whenever new posts are added. This way they don’t have to check in on their own. And you can even add extra incentive through discounts and deals that are only available to members. The upside for you is the opportunity to increase your mailing list. And all you have to do is add some kind of prompt when new readers view your blog. One of the best business blog writing tips you can follow is to listen to reader feedback and suggestions. And you don’t even have to wait – you can add a suggestion box for blog topics and remind readers periodically that their thoughts and opinions matter.